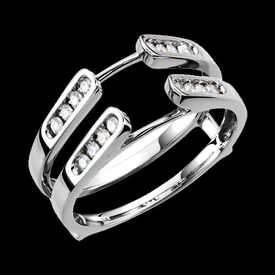 Fabulous 14k Yellow or White gold 1/2ctw diamond ring guard. Vibrant baguette and round diamonds are SI 1 clarity H+ color. 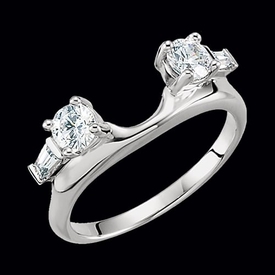 This ring guard is a beautiful enhancement to your diamond solitaire. Width at the base of this diamond ring guard is 5.6mm. Scroll Design Ring Guard. It's pretty design and affordable price makes this Ring Guard a Good Choice. Stock size 6-7, custom order in any size. 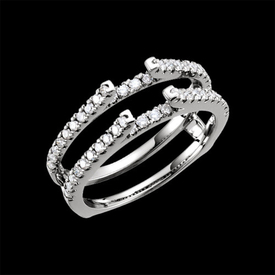 Price shown is for the 14k Gold option, special order this ring guard in Platinum. 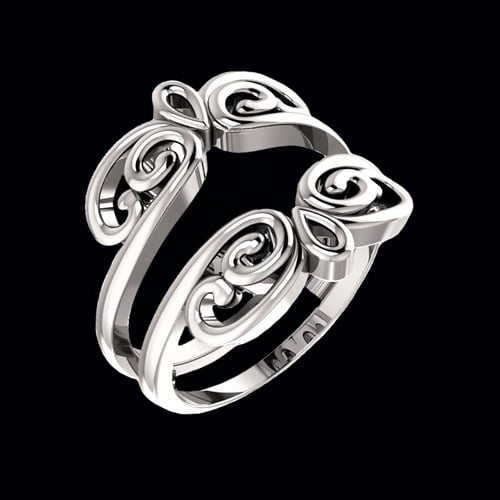 Stunning 14kt Gold scroll design ring guard. This style is available in 14k white, yellow, or rose gold. Diamond accents are dainty and just add a little dash of flash, they total .05ctw. This guard weighs 7.7grams. 14kt White gold 1/2ctw diamond ring guard. This pretty ring guard is set with SI 1 clarity diamonds H+ color. 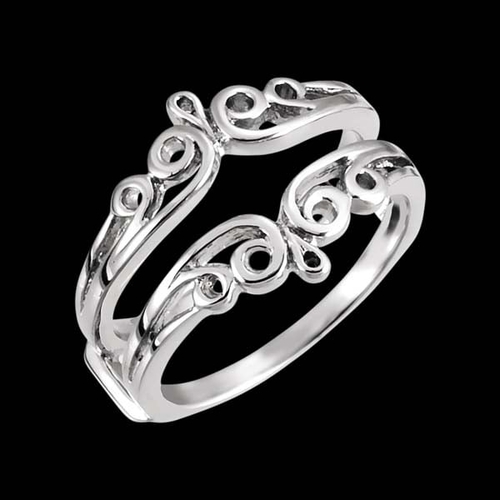 Pretty 14k gold scroll design ring guard. This gold ring guard is available in 14k White, Rose, or Yellow gold. This design has a closed back and measures about 5.9mm wide at the shank and about 12.75mm wide across the top. 14k Gold 5/8ctw Wrap style ring enhancer. This lovely design features 5/8ctw SI 2 clarity G-H color diamonds, a 3.9mm round either side then 3x2x1.5mm tapered baguettes. Custom order this design in 14k Yellow or 14k Rose gold. 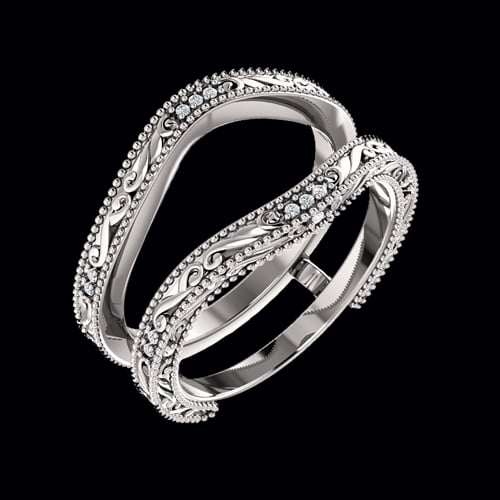 Captivating 14k White gold diamond ring guard. Stunning baguette and round diamonds total 3/4ctw in this diamond ring guard and are SI clarity H+ color. Diamond ring guard is about 19.7mm wide across the top 6mm at the shoulder. 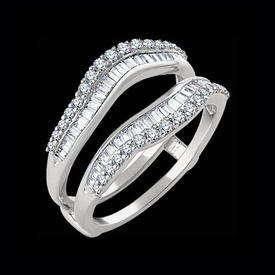 Add a lot of sparkle with this gorgeous baguette and round diamond ring guard. Beautiful 14k gold Rope of Diamonds ring guard. 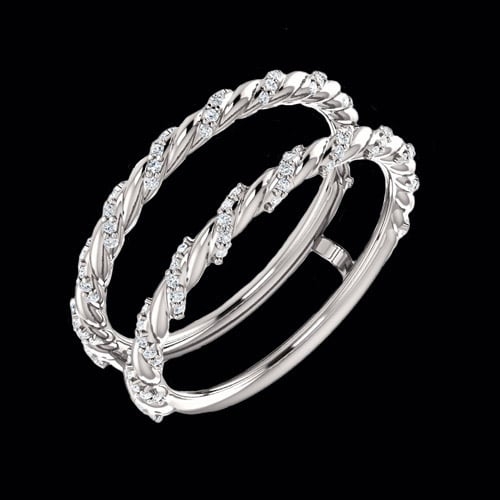 Diamonds twist around a 14k white gold ring guard to create this unique design. Diamonds total 1/4ctw and are SI2 clarity G-H color. Ring guard measures 6.35mm wide and your diamond solitaire should slip into it nicely. Pretty 14k Gold simple design ring guard. 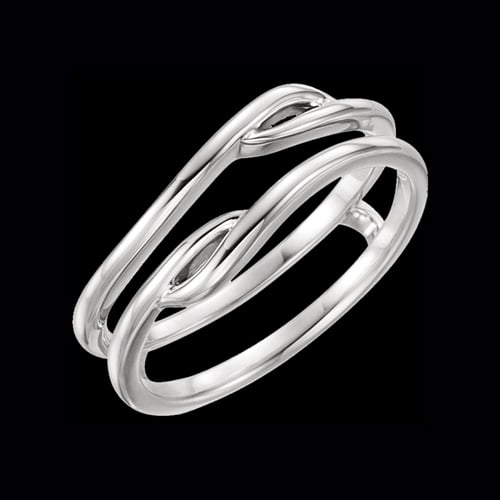 This ring guard is available in 14k Yellow, Rose, or White gold. Ring guards are such a lovely way to accent your diamond engagement ring, collect a few for different looks to suit your mood. Beautiful 14k Gold diamond and Sapphire solitaire enhancer. This style available in 14k White (shown) or Yellow gold. Diamonds and Blue Sapphires total 1/5ctw. The diamond ring guard measures 6mm wide. Add a little color to your lovely solitaire with this enhancer. We're happy to size this item for you but custom sized items are non returnable. 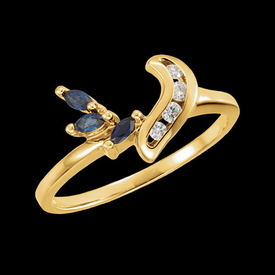 Sapphire Gold Ring Guard. Vibrant Blue Sapphires will add excitement to your center diamond. 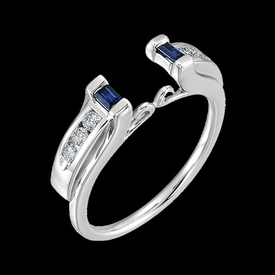 Genuine sapphires total .33ct tw in this design and are AA quality stones. Custom made to order item. Ring measures 5.1mm at the shoulder, top height is 3mm top width measures 11.2mm. 14k Gold offset diamond ring-guard. This ring-guard holds 3/8ctw marquise and round diamonds. Unique ring guard at an affordable price. Diamonds are SI 2 clarity, G-I color. Stock size 6, custom order your size, custom items are non returnable. Ring guards or enhancers are a great addition to your already lovely solitaire. 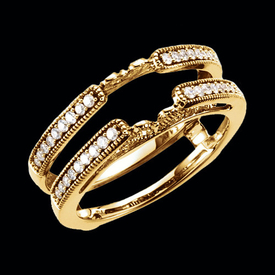 Dazzling 14k gold diamond ring guard. 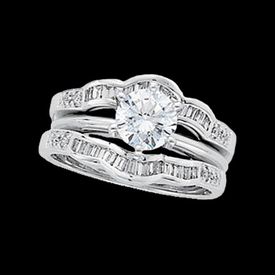 Unique diamond ring guard cradles your diamond solitaire in this beautiful setting. Diamonds total 1/3ctw and available in 14k White, Yellow, and Rose gold. Diamonds are SI2 clarity H+ color. Ring guard measures 19mm wide across the top. Vivid Genuine Green Emerald and gold ring guard. This unique design holds 10 round Emeralds totaling aprox. .51ctw. Very pretty ring guard. Special order this item in 14k White gold or Platinum. 14k White gold baguette and round diamond ring guard. 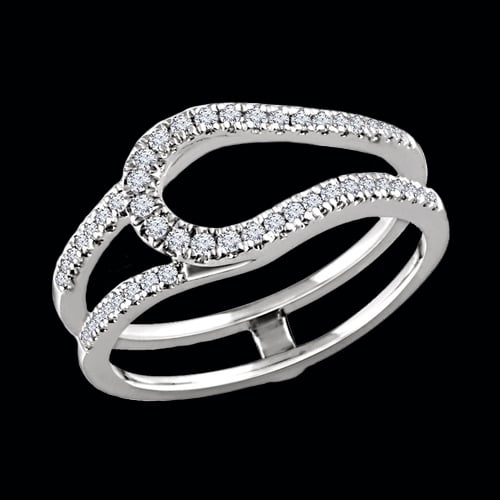 This ring guard holds 1/2ct tw lovely diamonds.Special order in 14k Yellow gold. Diamonds are SI clarity, G-I color. This diamond ring guard measures 9.7mm wide. Stock size 6. 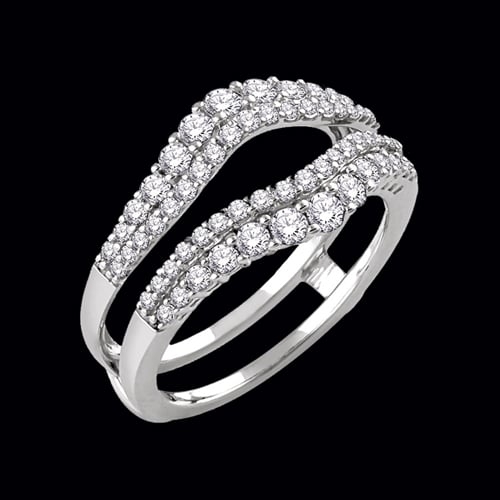 Beautiful 14k Yellow or White gold diamond ring guard. This guard features a beaded border and is set with 1/4ctw SI 1 clarity H in color accent diamonds. Stock size is 7. 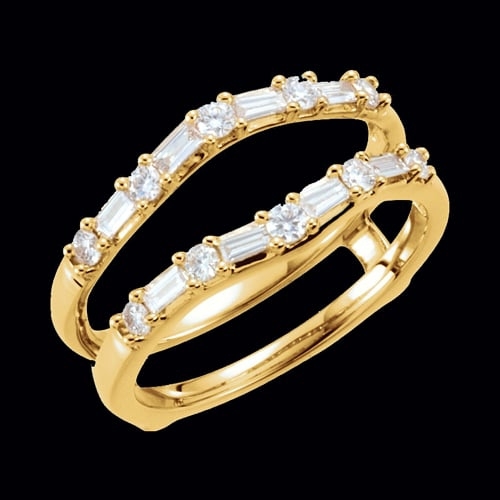 Stunning 14k White or Yellow gold double diamond rows ring guard. Diamonds total 1 carat in this ring guard and are brilliant SI 1 clarity H+ color. Diamond ring guard measures 6mm wide and is stock size 7. A beautiful accent to your diamond engagement solitaire. 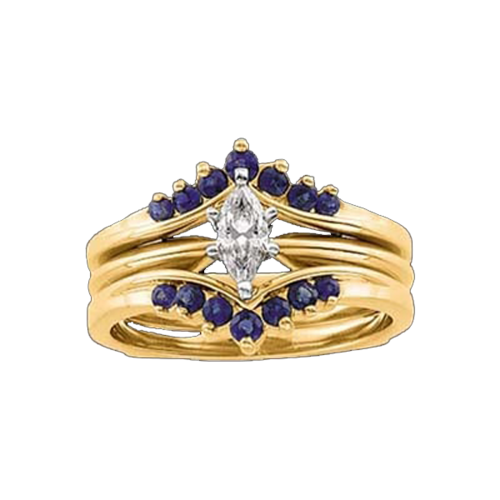 14K Gold Sapphire and Diamond Solitaire Enhancer. Lovely Design holds three 3 x 1.5mm Sapphires and .07ct tw Diamonds. This pretty enhancer or solitaire wrap is shown wrapped around a 3/8ct tw diamond solitaire. Stock size: 6. We're happy to size this ring to any custom size but note sized items are non returnable and will add 7-8 business days to shipping time. 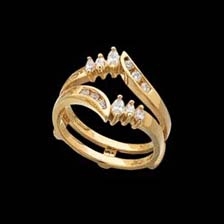 Lovely 14k gold 1/2ctw diamond ring guard. Diamonds are SI 1 clarity G-H in color and add a brilliant accent to your diamond solitaire. 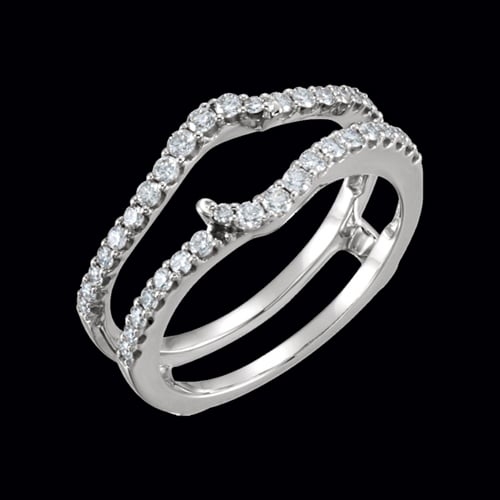 This diamond ring guard is stocked in a size 7 and available in 14k White (shown) and also 14k Yellow gold.